Several Wolffs are currently working on the construction site of the largest hotel in the world, the Abraj Kudai in Makkah. 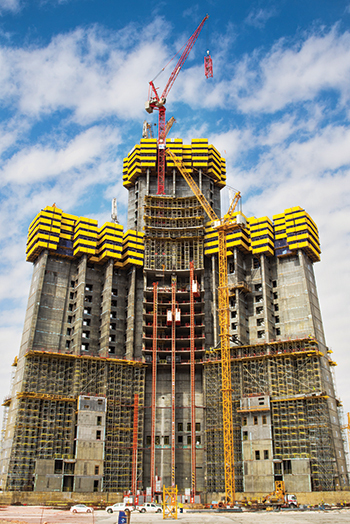 Wolff cranes are playing a key role in the construction of the kilometre-high Jeddah Tower, which on completion will be the world’s tallest skyscraper. A pack of Wolffs is helping build the highest skyscraper in the world, the Jeddah Tower in Saudi Arabia, where the red giants will be taken higher up than ever before. The cranes currently include 12 Wolff 7532 saddle jib cranes, which are used primarily for moving loads on the ground and for construction of the podium at the base of the tower. Also in operation is a Wolff 355 B luffing crane with a 40-m jib and a maximum lifting capacity of 28 tonnes. It is positioned in the triangular-shaped core of the tower, forming the focal point of the Y-shaped building floor plan. A second Wolff 355 B is to be set up in the very near future. Both luffing cranes will be on 48-m-high towers and raised step by step with the building, by means of an internal climbing procedure, up to a height of approximately 580 m.
“They jump between 12 to 15.5 m higher with every climbing step,” says a spokesman for Wolffkran. Wolff 355 B on the Jeddah Tower ... the luffers are raised step by step with the building by means of an internal climbing procedure. The spokesman says erecting and operating the two luffing cranes at a height of several hundred metres presents a special challenge with the high wind speeds that can prevail at these heights. 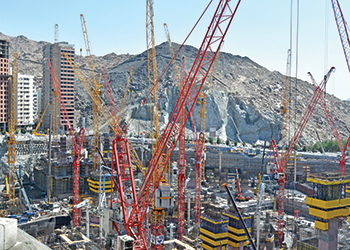 “Our Wolff 355 B cranes are impressive on these sites due to their very high working speeds of up to 185 m per minute and a hook path of 920 m,” says Habib Mikati, managing director of Wolffkran ISS in Dubai, UAE. “They also have significant lifting capacities when compared with the competition for the compact working radius relevant for this project,” he adds. According to the spokesman, besides the technical product features of the Wolff cranes, the proven collaboration between Roots Group Arabia and Wolffkran was also decisive for the cooperation on the Jeddah Tower, in particular with regard to the technical project support provided by the Wolffkran engineers. The Jeddah Tower is a project of international significance. The skyscraper will be the centre of an entirely new district, which is currently being built along the Red Sea in Obhur – Northern Jeddah. The tower sits on 270 piles that range between 45 and 110 m in depth and have a diameter of 1.5 to 1.8 m. At a height of 538 m, it will have one of the highest observation platforms to be installed worldwide. The building, designed by British architect Adrian Smith, will house luxury apartments, offices, shops, and a Four Seasons hotel over 530,000 sq m.
Approximately 200 red Wolffs have been used in the past six years on construction sites across the kingdom as part of the long-standing and proven partnership between Roots Group Arabia and Wolffkran. Many other Wolffs are currently at work elsewhere in Saudi Arabia, such as the largest hotel in the world, the Abraj Kudai; the ongoing extension of the Holy Mosque in Makkah; the extension of the Prophet’s Mosque in Madinah; the King Abdulaziz International Airport in Jeddah; Saptco bus station; and a new hospital in Makkah. They were also used in the construction of the prestigious Princess Nora bint Abdulrahman University in Riyadh.